Tanghalang Ateneo, the longest-running theater company of the Loyola Schools of the Ateneo de Manila University, presents Marisol, its first mainstage production for its 40th Season: Sturm und Drang/Bagyo at Bagabag. The play, which earned Jose Rivera a 1993 Obie Award for Playwriting after its premiere in 1992, is born anew with the translation of Palanca Hall of Famer Rody Vera and the direction of up and coming dramaturg and director Erika Estacio. Marisol Perez is caught in the disorder of the world brought about by the senile God as she is left to fend for herself, without her guardian angel. She learns that the angels are waging a war against the Lord, to save humanity and reinstate order in the world. With her best friend June, June’s deranged brother Lenny, and some unusual faces she meets along the way, Marisol has to face the repercussions of the War of the Heavens, grappling with the fact that the faith that she has long relied on can no longer keep her safe. The magic-realist dark comedy dramatizes the titular character’s story of survival in an ultraviolent, racist urban jungle in the middle of a cosmic breakdown — The guardian angels of the world have decided to wage a coup d’etat against a God gone invalid and senile, unable to hold the universe together. The play will serve as a poetic critique of our contemporary reality equally in shambles, reeling under the pseudo-dictatorship of a senile “God.” The play seeks to reaffirm the triumph of humanity against adversity, profane or divine, and the need to reclaim our lost sense of beauty and order through revolution. The production boasts its cast composed of purely student talents from the Loyola Schools. Tanghalang Ateneo’s CJ Lubangco plays the role of Marisol Perez, a young woman who fights for survival in the midst of the ongoing war between the angels and the senile God. MJ Vitug alternates with Riki Angeles as June, Marisol’s feisty best friend and co-worker who takes Marisol in after she runs into trouble. Ethan Manalo plays the role of Lenny, June’s younger brother with an obsessive desire for Marisol. Chrisse Joy Delos Santos plays the role of the Angel, Marisol’s guardian angel-turned-soldier who leads the angels in their revolutionary war against God. Renzo Guevara plays the role of The Man with Golf Club, a young madman who confronts Marisol on her way home. Austin Gonzales plays the role of The Man with Ice Cream, a former film extra who comes to Marisol’s workplace demanding answers from her. Rosalaine Pesarit plays the role of the Rich Woman, a woman once loaded with riches but now deep in debt, whom Marisol runs into conflict with at the onset of the heavenly war. Tanghalang Ateneo’s Nicole Chua and Datu Datu complete the cast as the ensemble. The artistic team of Marisol is composed of Tanghalang Ateneo Artistic Director Guelan Varela-Luarca, Rody Vera (Translation), Erika Estacio (Direction), Tara Jamora Oppen (Assistant Directors), Mark Dalacat (Set Design), Darwin Desoacido (Costumes Design), D Cortezano (Lighting Design), Teresa Barrozo (Sound Design), Lucas Abaya (Graphics Design), and Dana Lee (Graphics Design). 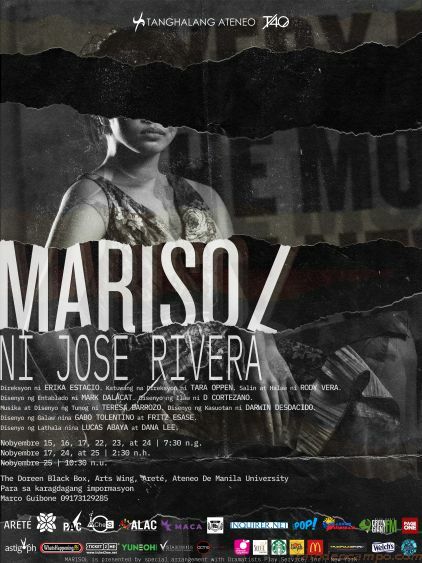 The playdates of Marisol are November 15-17 and 22-25. Performances start at 7:30PM on Thursdays to Saturdays. Matinee shows are at 2:30 PM on Saturdays and Sundays, with an additional morning show at 10:30 AM on Sundays. The production will be staged at The Doreen Black Box, Arete Arts Wing, Ateneo de Manila University. For questions and additional details about the show, please contact Marco Guibone at 09173129285.